As much as I give Richmond a hard time, it is never about the food. There are so many options for Chinese cuisine, it almost seems like you're in another country (much like the driving). 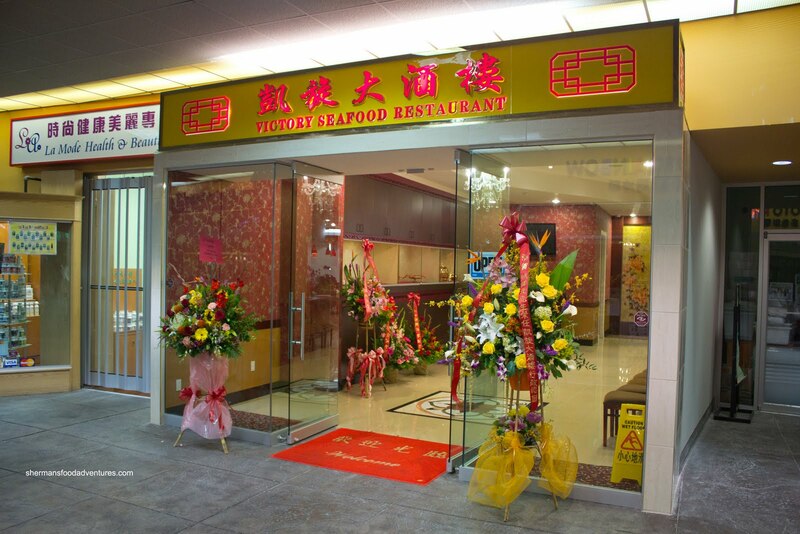 However, with an Asian population that is nearly at 50%, the number of good Chinese restaurants in Burnaby is surprisingly few. If we only count the larger Chinese restaurants, they only include: Fortune House, Top Gun, Grand Dynasty and the "customers are dirt" Po King. 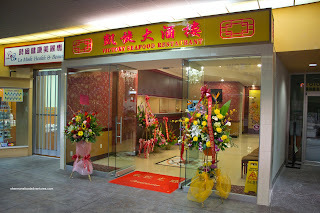 Now we can add another to the mix in Victory Seafood Restaurant located in Crystal Mall. Occupying what was once Victory Travel, the restaurant is large lengthwise a nd with little in the way of obstructions, is perfect for wedding banquets. My parents had their eye on this place for awhile since it had been under construction. Little did we know that our random dinner would be on their opening day. With that in mind, we had realistic expectations and were willing to cut them some slack since a restaurant is never at full-operation until at least a month later. With that in mind, we were quite forgiving of the haphazard service. They were trying their best and were profusely apologizing for any mistakes. On a side note, that is refreshing for a Chinese restaurant. It seems that some places do not care about their customers and almost feel it is a privilege to eat at their establishment (such as Po King). My personal feeling on this is as the older generation is displaced by the newer generation of Chinese patrons, these type of "good value, bad service" Chinese restaurants will need to either buck up or risk losing a large portion of their customers. I digress. So, the whole family made it to dinner tonight at Victory and upon entering the place, we were graced with a dining space that was both spacious and classy (complete with table linens and cloth napkins). We decided to go for their set meal for 4 and added an extra dish for good measure. 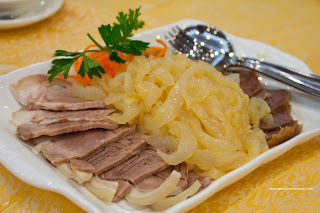 The first item was the Appetizer Plate consisting of jellied pork hock, jellyfish and sliced braised beef shank. I found the sliced pork hock to be good in both texture and flavour. The jellyfish was slightly on the chewier side while still having a nice snap. It was properly marinated with enough soy, white pepper and sesame oil. The beef shank had a nice gelatinous quality to it; yet it was slightly on the sweeter side. 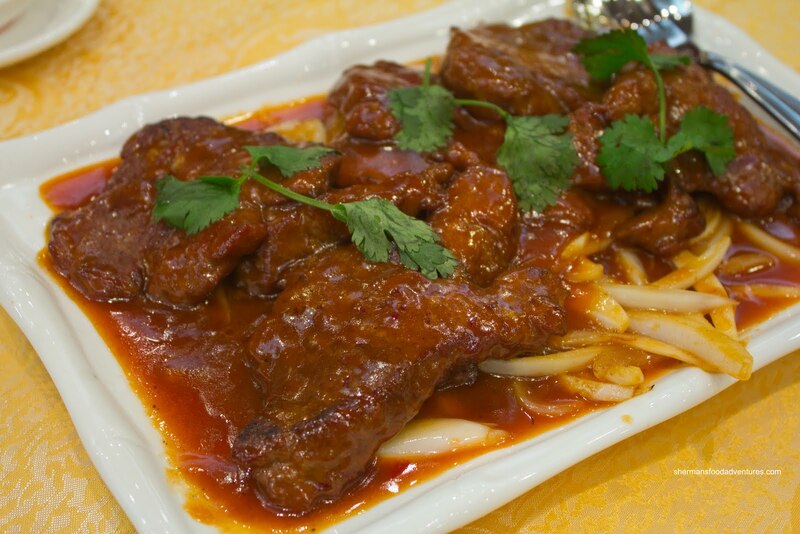 Since it was their first dinner service, the expedition of dishes was slightly out-of-whack and the Chinese-Style Beef Tenderloin showed up next. Despite the name, it is rare that actual beef tenderloin is used. Rather, it is usually top sirloin marinated until it is tender. This was almost a perfect balance between tender and still maintaining a beef texture. It was cooked medium-rare and the sauce was tangy with a hint of Worcestershire. The Fish Maw & Crab Meat soup arrived next and was easily divided into 6 bowls (so if you actually had 4 people, you'd get 2 extra bo wls). Although the soup was slightly thin, it was seasoned nicely. There appeared to be some depth while not being salty or overly sweet. There was a good amount of fish maw and crab as well. 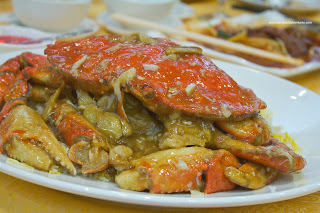 On the topic of crab, the Crab with Fried Rice arrived next. 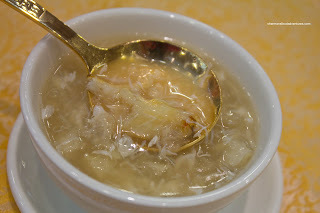 Normally, the crab is prepared with green onion and ginger in starch-thickened consomme; but we omitted the green onions. Despite this, the sauce was still very flavourful and had the right consistency. The crab was meaty and fresh while the star of the plate had to be the fried rice. It exhibited plenty of wok heat both in flavour and texture. Loved the abundance of egg in it too. The strangest item of the dinner had to be the Stir-Fried Sea Cucumber, Celery and Wood Ear Mushroom. 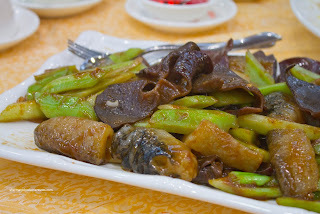 The individual components of the dish were fine with the sea cucumber being soft while still intact, the celery being crisp and the wood ear mushrooms being crunchy. However, they used hoisin sauce as the main flavouring agent and for me, that really didn't go. It was too sweet. A simple oyster-based glaze would've sufficed, especially with a delicate product such as sea cucumber. Our last dish was the Black Bean Spareribs served in a pumpkin squash. This was an interesting dish which probably needs a bit of tweaking. The squash could've used a bit more cooking and the spareribs could've used a tad less baking soda. Otherwise, it was fine in terms of flavour. 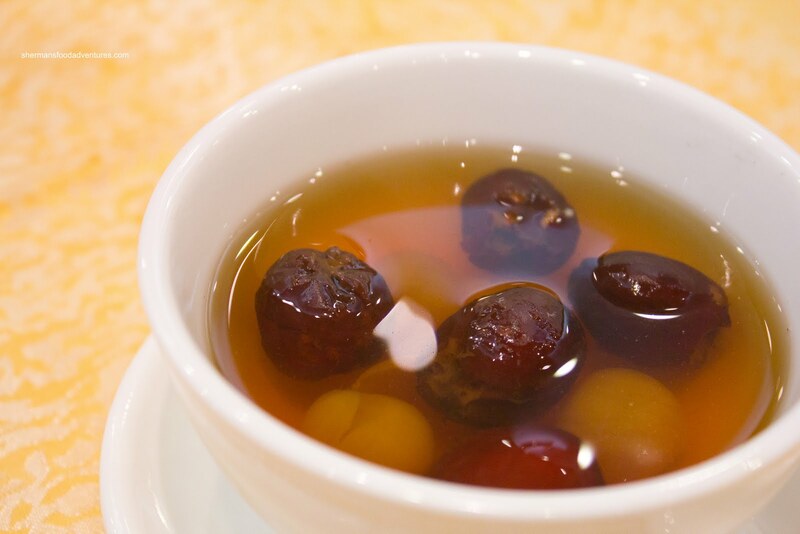 As part of the meal, we got dessert which was the Lychee, Dates and Almond Sweet Soup. Normally, I am as happy to see a Chinese sweet soup as I am happy about a prostate exam. You see, most places put so much sugar into these soups that it is practically impossible to eat it. Not this one. I found the soup to be only semi-sweet while still exhibiting depth. 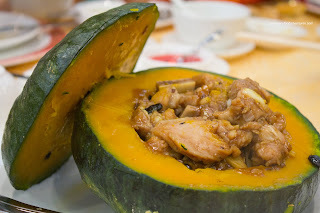 They used only a conservative amount of pian tong or Chinese brown sugar. 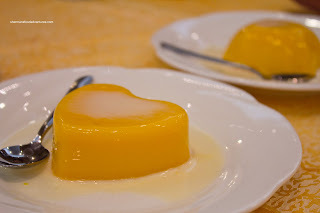 Lastly, for the kiddies, they gave us Mango Pudding. It was the typical gelatin-thickened mango-like tasting pudding; but with slightly more mango flavour. My daughter liked it. And really, we liked our meal as a whole too, especially considering it was their first dinner service. Even without cutting them some slack, it was better than average. We also really appreciated the staff and management there since they seemed genuinely interested in pleasing each and every customer. More often than not, opening night can spell disaster. Looks like these folk knew what they were doing right off the bat. Good sign that. Maybe it's the gweilo in me, but Po King rocks! You simply cannot beat the free entertainment and moderately priced dim sum. It's a guaranteed good time! "It's located in Crystal Mall which means parking lot from hell"
The place seems a bit juxtaposed for the location, but that area is devoid of a decent Chinese seafood resto, so all the more power to them ! I'll tell my parents to tell all their friends who live in Burnaby, that'll help with business. Approx, how much was the dinner for 4? @KimHo & @Sue The dinner for 4 cost $128.00 plus the extra dish which was around $20.00 if I'm not mistakened. So not cheap. But it was good nonetheless. @LR I hate that parking lot.